Unfortunately the National Gallery exhibition, Rebels and Martyrs – The Image of the Artist in the Nineteenth Century closed yesterday and Tory Historian, preoccupied with other matters, did not manage to see it until the last day. The verdict: so-so. Some very nice pictures that we do not get to see very often, such as paintings by the Nabis group (though nothing by the Pre-Raphaelites who, though active later, had somewhat similar ideas) and a certain amount of information. It is the information I have issues with. It was inadequate and unoriginal. Something like this: up to the second half of the eighteenth century artists were perceived to be little more than craftsmen and spent most of their time trying to rise in society. 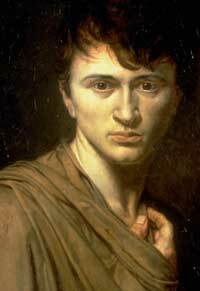 At that point, partly under the influence of the French Revolution and partly of new romantic ideas the concept of the artist and, particularly, the poet as a solitary genius outside society and misunderstood by it, was born. The artist no longer had ambitions within society but beyond it. This developed through the nineteenth century, taking different forms, such as the bohemian and the dandy, eventually acquiring the strange, almost mad attributes of the surrealist, the Secessionist and other ists of the twentieth century. Throughout all this, the artist was also seen as the martyr, tortured by the uncomprehending bourgeois society that also held the purse strings and the narrow-minded critic. Naturally, this artistic angst was linked to rebellion and left-wing politics. That is a reasonable summary but leaves out rather a lot. For instance, what happened to irony? Is it not ironic that artists should profess to have ambitions beyond society and yet suffer so acutely when society misunderstood? The irony deepened with those artists who became quite successful. Some analysis along those lines would have been very welcome. Then there is the question of politics. Undoubtedly, some artists, like Gustave Courbet became involved in left-wing politics, particularly the various French revolutions that culminated in the Paris Commune of 1870. But romanticism, as such, the precursor of all this rebellion and martyrdom was not necessarily on the left. Quite the opposite. The romantics of the early nineteenth century in Europe were rebels against the ideas of the Enlightenment, the French Revolution and the Bonapartist regime. Though Napoleon himself became the idol of a number of them, the ideology he represented was alien. Romanticism is individualistic; it emphasises individual people and nations – the precise opposite of the Enlightenment and of the French Revolutionary ideology that saw all development as one and all individuals as necessarily submissive to the Will of the People. It is not coincidental that Romanticism placed so much emphasis on history with many of the artists, far from being forward looking and left-wing, turning their backs on the modern world. Even those who did not, looked at national history, at the differences between nations, at the need to keep those differences going. A very backward, conservative idea. The left-wing aspect of Romanticism developed partially later on, as a response to the Treaty of Vienna and the European order established in the years after it. The nationalists of the 1830s and 1840s may have seemed radical but were, in fact, often harking back to an older order when their countries were independent and they had rights that had been destroyed by greater powers. In other words, the concept of the Romantic Artist is a deal more complicated than the straightforward summary that the exhibition tried to convey. As it happens, Tory Historian also managed to see one of Sir Carol Reed’s superlative films made during the Second World War: “The Young Mr Pitt”. 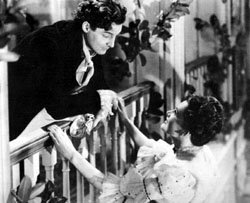 Robert Donat, acting with his usual under-stated sincerity, made William Pitt the Younger into a romantic hero, who sacrifices first his chance of happiness, then, effectively, his life for his country and the ideal of liberty. The film itself purveyed another concept of Romanticism – liberty. The country that was fighting for it under Pitt and under Churchill, when the film was made, was Britain. What an irony for all those Continental Romantics. For various reasons Tory Historian is not a great fan of Stanley Baldwin (possibly that attitude has grown out of a long-held conviction that Lord Curzon ought to have become Prime Minister in 1923). "A government is not in power, it is in office, put there by the will of the people." Let us remember this every time some pipsqueak of a politician blathers on about the difficulties he or she faces in "running the country". One of Tory Historian’s many weaknesses is an almost insuperable lack of interest in the actual military history of World War II. That is balanced by an abiding fascination with the politics around the various agreements before, during and after, particularly if these involved shenanigans to do with the great dictators. Thus of the three anniversaries to be marked today – start of the Blitz (1940), start of the Battle of Stalingrad (1942) and signing of the Nazi-Soviet Pact (1939) – it is the last of them that is of particular interest. 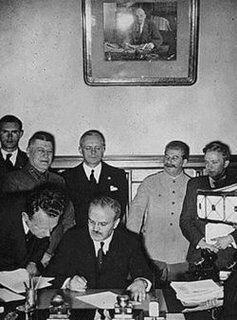 The Pact, signed by Vyacheslav Molotov, who had replaced the Jewish Maxim Litvinov as Soviet Foreign Minister in May of that year and by Joachim von Ribbentrop, his German counterpart. Though it is sometimes referred to as the Stalin-Hitler Pact, the two tyrants never met. The Nazi-Soviet Pact can be considered to be the real beginning of the Second World War. Whatever may have happened before that, once that was signed there was no way back. Though nominally a non-aggression treaty, it had secret clauses that referred to countries between Germany and the USSR falling into one or other sphere of influence. In practice, that meant being invaded and there was a great deal of territorial rearrangement in the subsequent months. The treaty stayed in force till June 22, 1941, that is Barbarossa Day, when Nazi Germany invaded what was then the Soviet Union (in fact, of course, eastern Poland, then western Ukraine that had been independent till 1938) and the deadly war between the two monstrous regimes began. Tory Historian sometimes finds it difficult to take the “martyrs” of the British labour or revolutionary movement seriously. There seems to be so few of them and so many potentially difficult situations are resolved peacefully in this country. Long may that continue. Take the Tolpuddle Martyrs, for instance. Six of them and all came back after being deported. All that oppression during the French wars, real though it was, pales into insignificance when compared to what was going on in France at the same time. Think of how many people were killed in the suppression of La Vendée and in Lyons. The one event that does merit sorrowful attention is the Peterloo Massacre of August 16, 1819, a clear example of panic and disorganization that resulted in 11 dead, one of them a woman, another a child carried by another woman and 400 injured. Still not on the La Vendée scale or the various massacres in Russia, let alone the Soviet Union, but something to talk about. The most interesting part of it, however, is the outcome. The original meeting was called to advocate parliamentary reform, to widen the franchise. 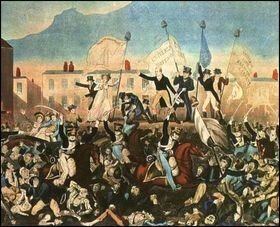 The horror of the Peterloo Massacre made those discussions more urgent, though it was not till 1832 that the Great Reform Act was passed, instituting a succession of constitutional reforms that would, in 1928 finally result in full and equal voting rights for all adults in the country. Possibly a more important development was the move to establish civilian police forces in Britain, the most important of which was the Metropolitan Police Force, signed into existence on September 29, 1829. The Home Secretary, Sir Robert Peel, is said to have been greatly influenced by the events on St Peter’s Field, in August of 1819. Tory Historian was brought up by an historian father, who had an overwhelmingly high opinion of western civilization and its progenitors, the Greeks of ancient times. Inevitably, the battles against the Persians, Thermopylae, Marathon, Salamis and Plataea were all names, familiar as household words (as the Bard said about another great battle). 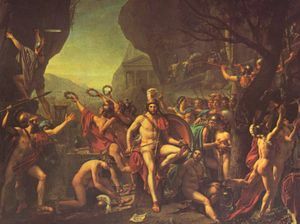 Today is the anniversary of the Battle of Thermopylae. Well, to be quite precise, the anniversary of its beginning. The Greek army, led by the Spartan King Leonidas, held up the vast Persian army for seven days before finally succumbing to the overwhelming numbers. that here lie we, their words obeying. The battle may not have been successful from the Greek point of view but its length and the severe Persian losses allowed the Athenians to prepare for the subsequent, ultimately victorious fighting. It was the West’s first victory, Tory Historian learnt early, the victory of freedom over slavery. Well, we need not go into the detailed definition of freedom and slavery. However, imagine Tory Historian’s astonishment during a visit to the recent excellent British Museum exhibition of Persian art and artefacts when all these great battles were dismissed as mere border skirmishes that did not affect the great Persian Empire at all. Just goes to show, history may be written by the victors but to define the victors is not so easy. Michael Barone is one of the leading commentators in the United States and he seems to be something of an Anglophile. At least, he writes frequently and, usually, with approval on aspects of British life. Here is his response, rather than review, to William Hague’s much lauded biography of William Pitt (readers will need to scroll down). Barone is greatly taken by Hague’s description of Pitt’s constant emphasis on the need for a long-term solution. One of the most interesting aspects of the book, in Tory Historian’s opinion, is the special insight into the parliamentary activity of Pitt’s day that is given by a man with political and parliamentary experience. It is outside the scope of this blog to comment on the politics of the Conservative Party as it is in 2006 rather than 1806, but one wonders what conclusions the author of this excellent biography has drawn to influence his own attitudes and statements as Shadow Foreign Secretary.